With the 6-foot outdoor cabinet secure on the quad lift chair behind us I murmurred, “So tell me again why we didn’t install this outdoor repeater cabinet back in October on one of the nice 70-degree days?” Suspended 20 feet in the air I was racing up to the summit of Gunstock Mountain sitting beside two other members of the Central New Hampshire Amateur Radio Club. “Anyone can do it then. We prefer to have challenging weather conditions that test our skills,” joshed Mark Persson, W1DDI. Ed O’Hearn, N1EO, was sitting next to us encased in his full-body ski suit, arctic boots, full-face warmer, hat, and heavy gloves. “I’m all set in case this chair lift stalls with a snow-making cannon pointed at us,” quipped Ed. 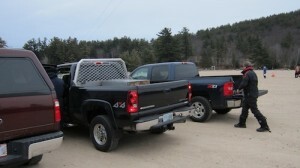 The pickup trucks, left to right, of W3ATB, W1DDI, and N1EO. The three of us met in the empty parking lot of the Gunstock Ski Resort at 7:45 am on a steel-gray Sunday morning. It was just five days shy of the winter solstice that would mark the first official day of winter. 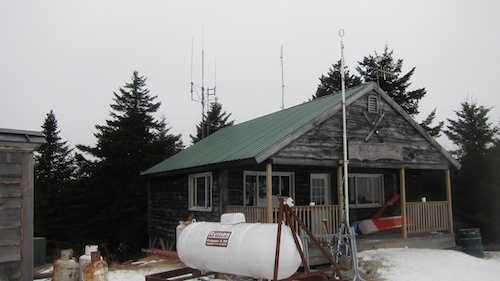 But thirty minutes later, at the top of Gunstock Mountain where the club’s 440 MHz, 2-meter and 6-meter repeaters reside, you’d swear winter had arrived months ago. It was windy, cold and the summit greeted us with snow and ice, albeit man-made. Our task for the morning was to install an outdoor radio-equipment cabinet under the ski resort’s Safety Building that sits directly on Mt. Gunstock’s summit. The rugged and weathered exterior of the building does an excellent job of concealing what’s inside. This nondescript building at the summit of Gunstock Mountain is an oasis of warmth and intoxicating aromas. If you’re one of the lucky people that gets to cross over the threshold of this wood-frame building, you quickly discover it’s a warm and cozy lair where the ski patrol volunteers hang out waiting to be called out on the slopes to assist a skier. The magical four-person ski-lift chairs wisked the cabinet, tools and supplies, and us up the mountain. By the time we got to the top, I was already shivering even though I had dressed for the weather. While dawn was breaking an hour earlier, I was walking out the door of my house debating if I should be wearing my firefighter bunker pants that keep you warm in sub-zero temperatures. I chose poorly, and those pants were eight miles away as the bird flies on a hook in my mud room. Oh well, I’ll know next time. 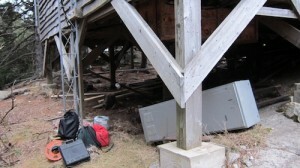 Here’s the metal cabinet after being lugged across the snow and ice to the underside of the Safety Building. Once at the top of the mountain, we slid the cabinet off the frozen vinyl seats of the ski lift and lugged it across the groomed snow to the front of the building. It was time to decide on a safe strategy on how best to get the cabinet under the building where it would soon be installed. We wasted no time getting to work using Mark’s paper template that allowed us to drill precise holes in the top of the cabinet that would accept massive lag bolts. Sharp drill bits soon were boring holes in the top of the cabinet. “Do you smell that? It smells like a donut shop is just around the corner,” professed Mark. I was obviously upwind of Mark, and the only sensory impulses my brain was receiving were the alarm bells telling me that the temperature of my fingers was starting to approach 32 F.
“Oh my gosh, I DO smell that,” I exclaimed as a gust of wind thrust the aroma of freshly baked cinammon rolls up my partially frozen nostrils. It was amazing my olfactory system was actually working in the tundra-like conditions. The repeater cabinet is lag bolted to the underside of the floor joists. Next step is to install the conduit for the electrical receptacle. By this time, we were well on our way to having the cabinet installed. It was a slick engineering feat that Mark and Ed had come up with. The Saftey Building hangs out over the southwest tip of the summit producing about 7 feet of head space at the far end of the building. Bolting the cabinet to the underside of the floor joists protects it from any overland water and keeps it safe from pesky mice that seek out the warmth of cabinets filled with warm tasty wires and cables connected to humming electronics equipment. Relocating the 440 MHZ and 2-meter repeaters to the exterior of the building allows us to have access to the electronic gear 24/7/365. Let me re-state that – let’s say any day a blizzard isn’t howling up at the top of the peak. Working under the building provided us with a considerable amount of protection from the biting wind, but every now and then a rogue blast of wind would lash us. Ed and Mark were the pros, and have extensive experience with repeaters, duplexers, controllers, power supplies and link radio equipment that will occupy the sturdy metal cabinet. My job was simply to hold things and give an occasional assist as one would expect from any apprentice. Understand that prior to this frosty morning, I had never before seen a repeater nor been near one. Just as we were finishing suspending the cabinet from the Safety Building’s floor joists, Rick Zach, K1RJZ, popped his head under the building saying good morning. Rick had come up with a plastic tub filled with tools and supplies to check on the electronics of the repeaters that were currently being bathed in the warmth and cinammon-roll atmosphere just above our heads. The 2-meter repeater is at the top of the photo. 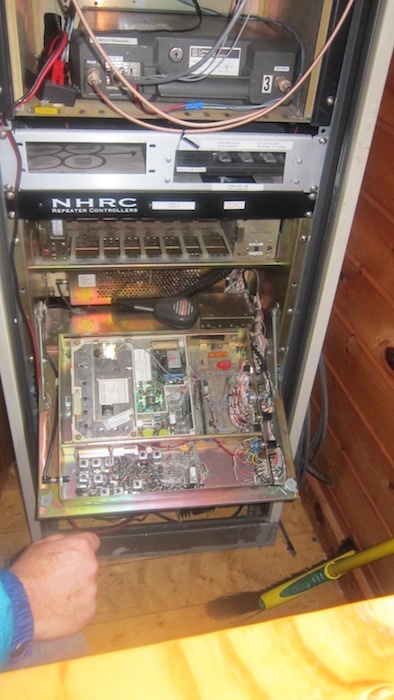 The 6-meter repeater case is open with all the electronics visible. I went inside for ten minutes to warm my nearly frostbitten fingers, and Rick gave me a quick tour of the current repeaters. It was pretty fascinating to see the array of electronic equipment that’s responsible for re-transmitting radio signals from countless operators who work this summit for both pleasure, and for more important public-safety events. The work party concluded with Mark and Ed installing the waterproof flexible conduit from the cabinet over to the edge of the building where the existing power extends to the indoor repeaters. Jim Craver, N1XBD, who works at the Gunstock Ski Resort helped finish the job by splicing in our junction box into the existing conduit. The job ended inside the toasty Safety Building with Mark, Ed and Rick inspecting the existing equipment, checking readings and insuring all was well with the repeaters. It was all greek to me, so I did the smart thing and just kept my mouth shut. The ski-lift operators allowed us to jump on the empty chairs that rotated around the giant bull wheel, and we were wisked back down to the parking lot. The view across Lake Winnipesaukee was gorgeous even though the sky was starting to fill with the first real snowflakes of winter. I was in my truck by 11:30 am headed back home to a roaring fire in my office and a relaxing Sunday afternoon. Suffice it to say the expedition up to the summit was well worth it for me. There’s no better way to bond with fellow club members than to do it under the most adverse weather conditions Mother Nature can conjure up. If you want to be fully immersed in the Central New Hampshire Amateur Radio Club experience, I highly recommend scheduling a trip to the top of Gunstock Mountain on a frigid December day! 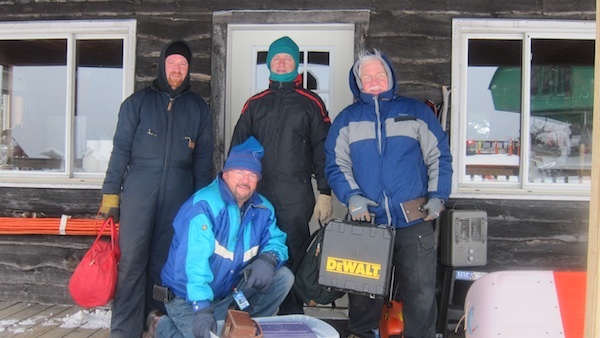 From left to right standing: Mark Persson W1DDI, Ed O’Hearn N1EO, Tim Carter W3ATB. Rick Zach K1RJZ kneeling.